Just Another WordPress Site (J.A.W.S.) 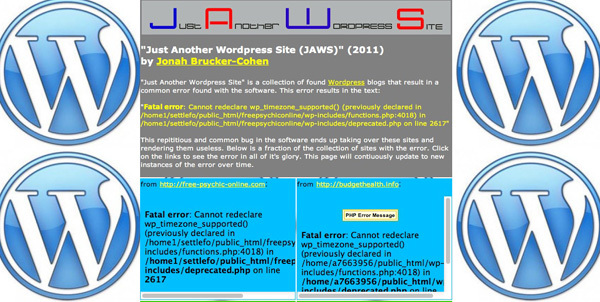 – 2011 | JONAH BRUCKER-COHEN, PH.D. Just Another WordPress Site (J.A.W.S.) – 2011 – JONAH BRUCKER-COHEN, PH.D.
“Just Another WordPress Site” is a collection of found WordPress blogs that result in a common error found with the software. This error results in the text:"Fatal error: Cannot redeclare wp_timezone_supported() (previously declared in /home1/settlefo/public_html/freepsychiconline/wp-includes/functions.php:4018) in /home1/settlefo/public_html/freepsychiconline/wp-includes/deprecated.php on line 2617"
This repititious and common bug in the software ends up taking over these sites and rendering them useless. Below is a fraction of the collection of sites with the error. Click on the links to see the error in all of it’s glory. This page will contiuously update to new instances of the error over time. J.A.W.S. takes issue with a common problem with the world of web 2.0 and automated content systems such as WordPress. Since the author of the website did not code it by themselves, they often have no idea how to fix code errors and leave them on a website, which ultimately turns the site into a “dead” site. J.A.W.S. attempts to collect and aggregate all of these “broken” sites into a shared web page in order to call this phenomenon into attention.